You’ve gone through the process of setting up social media accounts for your eCommerce business, you’ve taken the time to learn how to write a quality post…but are you posting the right content on your different platforms? Not all content is created equal, and not every type of post is going to work on every social platform. Knowing which content is most appropriate for which platform will help you skyrocket your engagement rates. Here’s your guide to what goes where on (just about) every social network. We tend to see Facebook posts that span a wide variety of content types. Facebook has the largest audience – there are over 2 billion monthly active users. “Liking” a post is one of the most recognizable social actions on Facebook. Studies show that 44% of Facebook users “like” content in their news feeds at least once per day. So what content garners the most likes? What makes someone like a post? Video posts have the highest Facebook engagement rates compared to any other type of post. Video and Facebook Live videos have begun to dominate news feeds. 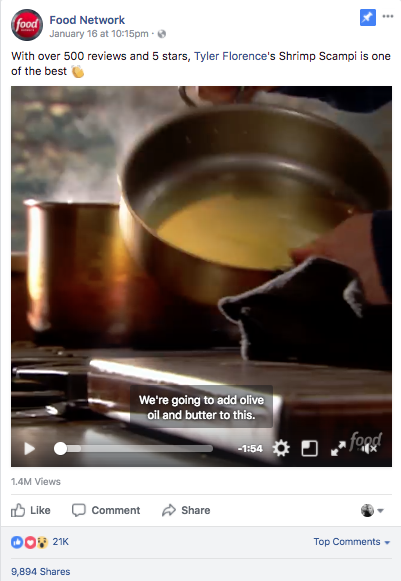 Facebook’s autoplay feature means that video posts start playing on their own as you scroll past them, making them much more eye-catching than static posts. Since these posts are more eye-catching they get a higher organic reach. 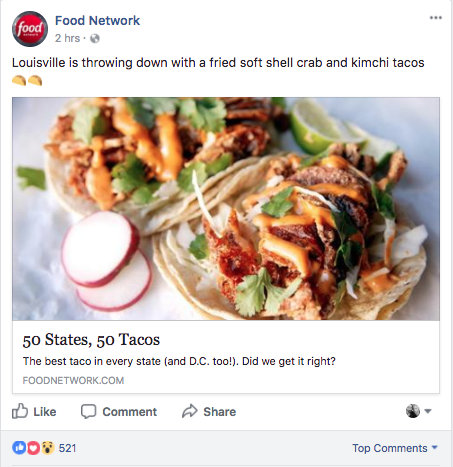 In this example from Food Network, the winner is clear – the video post has 21k social reactions (“likes”, “loves” etc.) on it, while the static post still has a high engagement rate, it falls clearly behind with only 521 social reactions. Closely behind video posts in terms of engagement are posts that share an image with a link. Typically the content of these posts should be a mix of blog articles you have created and high-quality content curated from third-party sources. These posts establish your authority in the field while providing your audience with content that is relevant to them. On the Customer Paradigm Facebook page, we share all of the content that we write on our blog with an image that allows viewers to quickly determine what the link is about. Studies show that 39% of people use Twitter to keep up with the news. Posts on Twitter move in real-time. You have to be able to hook people quickly into your content before they get distracted. Since people use Twitter primarily for news, this is a great platform to share blog posts from your site and other relevant industry news. However, you can’t just post a link without context written around it. You need to write a call to action, something that prompts people to click on your link because they want to learn more. In this post from AAMCO Colorado, they tempt readers with tips to avoid a car accident – while you might already know the tips in the article, you are compelled to click on the link to make sure you aren’t missing out, nobody wants to get into a car accident. In the same way that video is effective on Facebook, GIFs are a way to catch people from a visual standpoint on Twitter. In 2015 people shared 100 million GIFs on Twitter. GIFs are a way to present a moving image. GIFs are easy to consume visual content, and if used correctly can help to enhance a brand’s message. People are far more likely to remember something if it contains a visual. A GIF is a way to create memorable and eye-catching visual content that lures viewers in. Mr. Peanut uses this GIF on Twitter to display their product in an eye-catching way. LinkedIn is a professional networking platform. The most suitable types of posts for this platform are posts that appeal to a professional audience. Posts that talk about your company news, company culture, and are educational are going to do best on this platform. LinkedIn is also a place that many people use to get information about job positions. LinkedIn is the perfect platform for positioning yourself as an expert in your industry. The audience on LinkedIn is a professional audience, people are looking for links to articles that talk about company culture, employee experiences, and educational material related to your field. 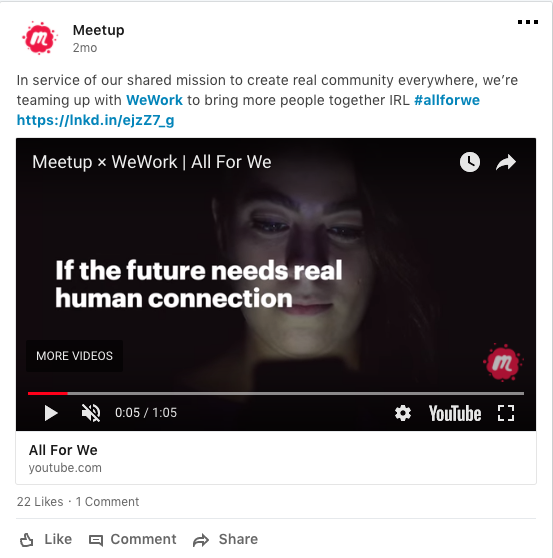 For example, Meetup.com posts a video and a link to information announcing a new business partnership. LinkedIn found that posts with images have a 98% higher rate of engagement and posts with videos have a 75% engagement rate. So consider incorporating visuals when creating your link posts. Your LinkedIn company page is the perfect place to post your job listings since many people are using this platform to look for prospective careers. There are two ways you can utilize this platform for job listings. Google utilizes both methods – the first, creating a link post that appears as an update on their company page and their audiences news feeds. The second method for sharing job listings is to use the LinkedIn service that allows you to post jobs on LinkedIn. This allows LinkedIn to recommend your open positions to a wider audience. Your job postings on LinkedIn show up in a tab on your company page and your viewers can click on that tab to see all openings. If you are selling a physical product – i.e. clothes, food, shoes, makeup, custom detailed cars – Instagram is the perfect platform to show off high-quality images of these products. Especially, if you have lifestyle photos of your products – images that show your products in use in various different settings. This helps customers get an idea of how their product might actually look in their own lives. 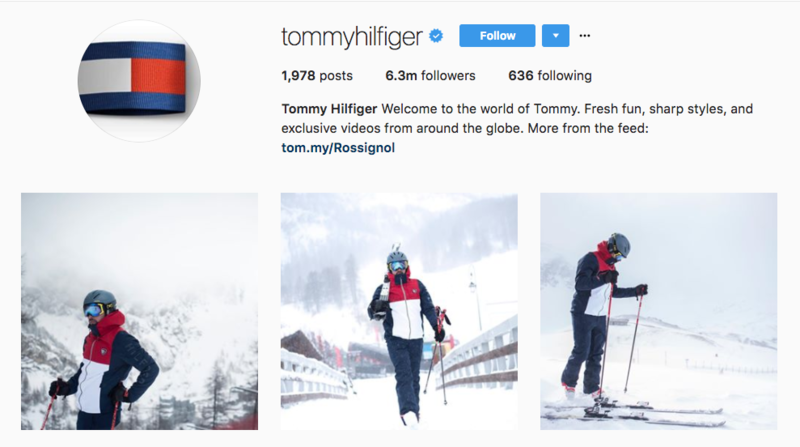 Tommy Hilfiger shows off a new ski coat they sell on their Instagram by posting different shots of someone wearing the coat while skiing. Inspirational content is one of the most popular types of content on Instagram – there are currently 94 million posts tagged with” inspiration” and 49 million posts tagged with “quotes”. Create images that are relevant to your brand, and create a reaction in your viewers – if you don’t have design chops – don’t worry, there are dozens of free services online (I personally like Canva) that can help you make images easily. Brit & Co is a company that provides online classes and creates motivational content. 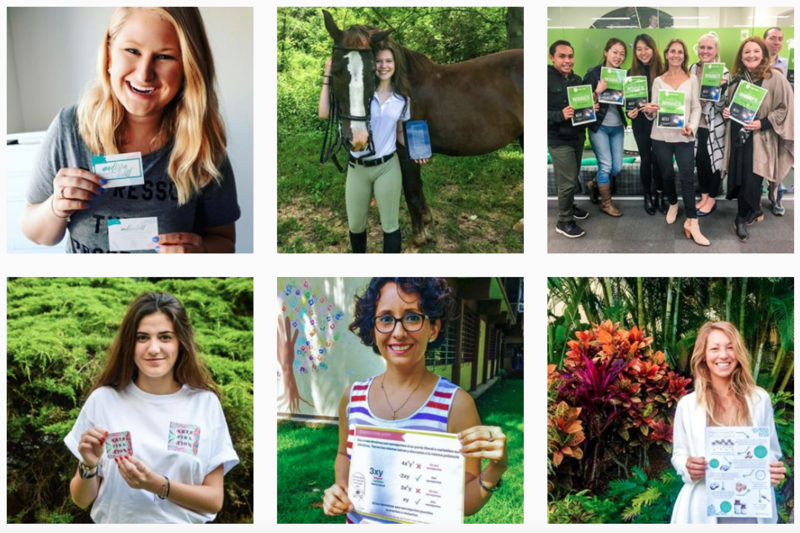 They use their Instagram to post quotes and inspiring images that support the message of their brand. We’ve predicted that user-generated content is going to be big this year. User-generated content builds trust for your brand. 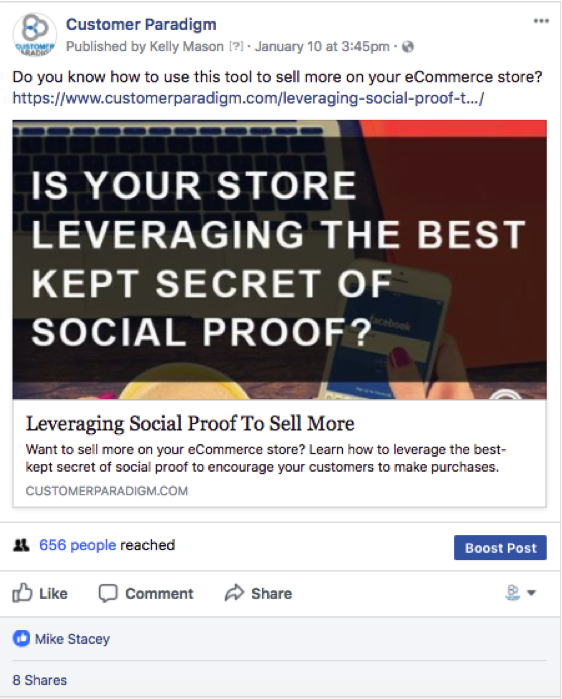 Share what others are already posting about your brand, its an easy source of content that also shows your customers you are listening to what they have to say. 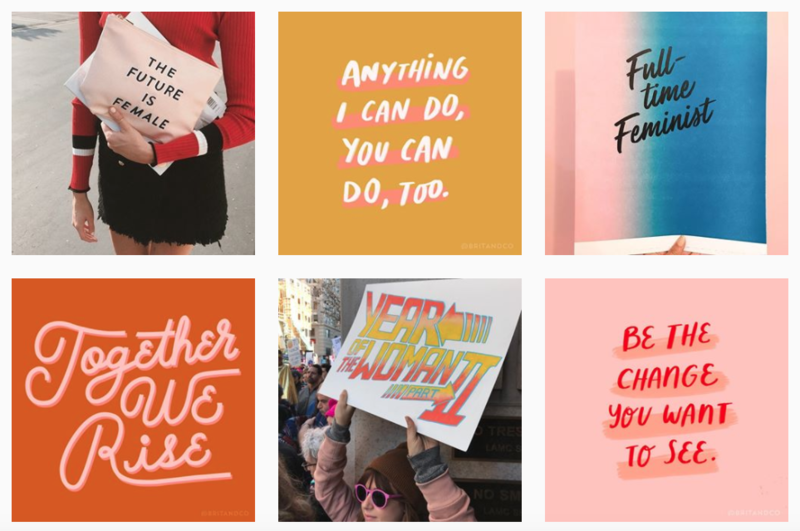 Canva is a freemium online service that helps you create images, posts various images onto their Instagram from people that have used their service. This shows off how their service can be used in a wide variety of applications to their audience. Pinterest is another visually based platform. eCommerce businesses can use Pinterest in a huge variety of ways – from creating curated boards, to gift guides, how-to guides, and infographics. Posts on Pinterest appear in viewers feed with a vertical orientation, Pinterest states that the best ideal image aspect is a 2:3 ratio. This makes it the perfect platform to post longer vertical images like infographics and how-to guides. You can see our Pinterest feed is filled with vertical infographics, you can see the whole vertical length of the image in your feed and then click on it to see a larger version. Gift guides and curated boards are the perfect way to highlight products in your catalog. Pinterest’s visual formatting is a great platform to create on. You can create a board around any topic, eye-catching lifestyle images are widely shared throughout the platform. Clothing and home goods company Anthropologie uses their Pinterest to create boards around different topics of interest that show off their products through visually beautiful images of their products in use alongside other images that are relevant to the theme of the board. Cross-posting is posting the same content, with the same copy and formatting, on all of your social networks. If you are handling all of your social media marketing on your own, this might seem like the easiest solution. As an eCommerce merchant, you’re busy, and this tactic might seem like a good way to save time. However, cross-posting has limitations. Since each platform has different types of content that perform better than others, you run the risk of creating a post that is perfect for the audience on one platform but falls flat on another. For example, Instagram comes with the ability to share your Instagram post directly to other social platforms. However, an image based post with hashtags that work on Instagram, is not going to work the same way on a platform like LinkedIn. 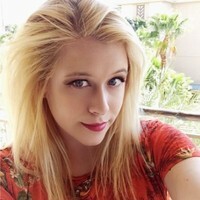 Cross promoting, is promoting the same message across social networks, but with content (images/video, copy) that is unique for each platform, you are posting on. It’s also important to note that some content might be appropriate for some social networks, and not others. For example, a job posting might be appropriate for your for LinkedIn and Facebook audiences but that same content is not going to work on a visual based platform like Instagram. You will need to know which audiences are on your different platforms and determine which content will be important to those audiences. While cross-promotion may take a little more time, you will see a higher success rate with your posts. Focus on optimizing your content for each platform you want to share it on. Content that meets the expectations of the audiences on your different social networks will have higher engagement rates (impressions, link clicks, conversions, social likes/shares). For example, if you are promoting a new blog article on your website you might post a link with an image onto your Facebook, but a shorter catchier text post with the link on your Twitter feed. 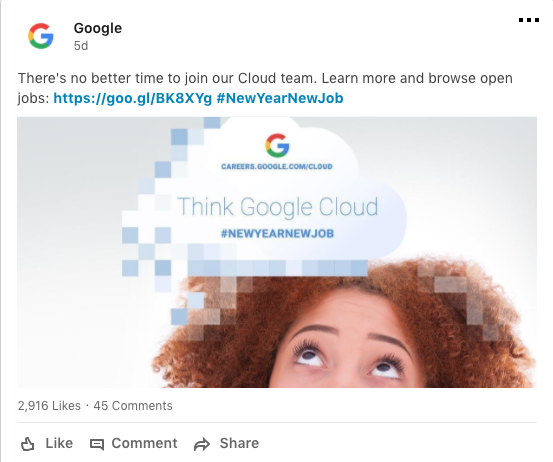 While these are just guidelines of what types of posts typically work well on some of the major social media platforms, they should help you get started experimenting with post types and learn what works best for your business. We would love to know what types of content work best for your business! Connect with us on Twitter or Facebook and let us know. Need help getting started with a digital marketing plan for your eCommerce company? Connect with a member of our strategy team today and start reaching your goals.